Armando Biondi, AdEspresso: Facebook is out to kill Google. There, I said it. You probably think I’m crazy, but there are a bunch of macro-trends coming together, as well as several moves that Facebook got right. that support this. But first, a disclaimer: I’m the cofounder of AdEspresso, a Facebook partner that manages advertising for SMBs and SMEs. As a Marketing Partner, we do have access to privileged information not disclosed to the public, as well as a view on a broader dataset of around $250 million of Facebook Advertising Data, but the analysis that follows is not based on any of the above, rather on public information that has been disclosed in the past few weeks paired with public insights from thought leaders. Now, let’s get to the fun part. That’s because the personal computer is not really “personal”; it’s actually shared among a small group of people; at least most of the time. The smartphone, however, is very personal, so much so, in fact, that91 percent of all U.S. citizens have their mobile device within reach 24/7. You too, I bet. Think about it for a second. When was the last time you searched for news on Google? If you’re the average person, it was probably a while ago. That’s because nowadays news is discovered through social media instead of directly searched for. If you behave like me, you rarely go on news websites, you just look for news emerging on your newsfeed. 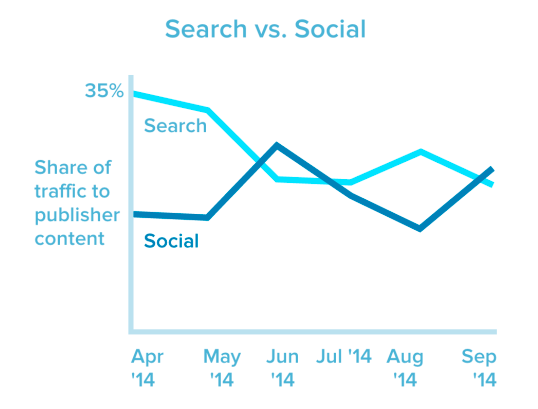 This chart from Marketing Land visualizes well the shift we’re talking of. But even more important than searching for news, there’s another shift you may have not recognized yet: Mobile is drastically decreasing the number of your searches, period. You don’t search when you’re on mobile, you open apps. Let that sink in for a second. When you’re in front of a computer, practically every action in your browser begins with a search. On mobile? Not so much. It’s slow and inefficient to write stuff, that’s why apps exist. One tap and you’re done. The combination of these two behaviors (mobile discovery vs. desktop search) generates probably the biggest threat to Google ever, given that the bulk of its revenues come from search. So while Google’s real estate on desktop/laptops (aka, the space it can use to serve you ads) won’t grow significantly over the next few years and will actually reduce given the shift to mobile (which accounts already for the majority of overall web traffic), Facebook’s real estate will. And there’s more. When it comes to video, the numbers are even more impressive. What YouTube (a Google property) did in 10 years, Facebook did in less than one (reaching 4 billion views a day, according to today’s news). Whoops. Socialbakers wrote about it in January, saying that Facebook Video is Now Bigger Than YouTube for Brands, along with the chart below. Oh, I didn’t mention the fact that Google already tried to get into social with Google+, very much probably the second worst Google product after Wave (you may remember it, or maybe not). Of course, the point is not in trying and failing, that’s perfectly fine, and Facebook has also launched tons of products that didn’t go anywhere (Facebook Credits, anyone?). But while Facebook was able to integrate this approach into a “hacker” culture that has so far paid off, Google has started to be perceived as a company doing too a lot of things at the same time — some of which, to be fair, is pretty impressive and forward looking — with no real direction. Some analysts just a few days ago went so far as to call this “Google’s Microsoft Moment” (here’s the Telegraph, and here’s Business Insider). Not exactly a compliment, if you ask me. 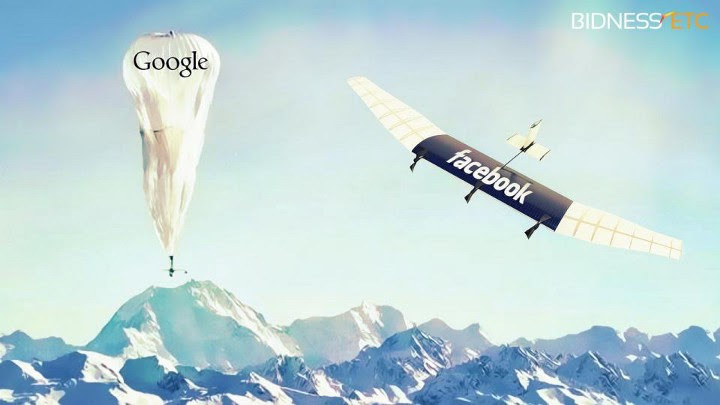 And I haven’t yet mentioned the effort both Facebook and Google are making to bring online the next 2 billion people, with drones on one side and balloons on the other. It’s a humanitarian effort, sure, but it also has business-related consequences, since doing so would mean doubling their total addressable market, and as a consequence the revenue potential. 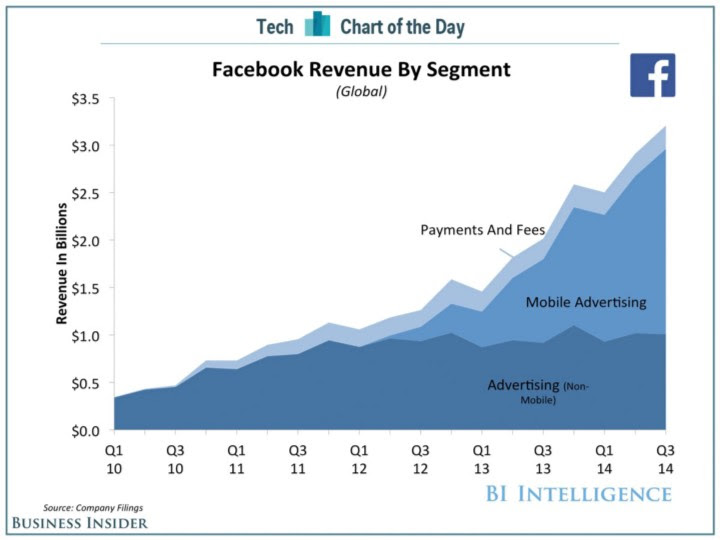 But between the two, because of the above trends, Facebook is the one that has the most to gain. And, of course, Facebook hasn’t just been playing around with virtual reality — it’s finally stepped into payments as well. Real ones. And what about the future of content? The news leaked just a few days ago that Facebook appears to be working on an exchange not for ads but for — wait for it — “content (like paid-for news articles or videos from brands, otherwise known as native advertising) on sites beyond the social network’s own platform.” It’s probably too early to speculate, but while Google wasn’t able to eat Facebook’s lunch, this could be a way for Facebook to (not so) slowly eat away Google’s. Pair that with payments, and you have a nuclear weapon. One thing that can be surprising to a lot of people is that Facebook’s and Google’s market caps are not so different. As of last weekend, Facebook was $226.09 billion, while Google was $359.63 billion. Facebook is practically 2/3 of Google — with a significant difference, though. Facebook’s market cap grew 41 percent year-over-year in the last 12 months, while Google practically stayed still. And if there is room in the global markets for one trillion-dollar company (which Apple is going to be very soon), there is room for more than one. And if Facebook is able to continue growing 25–33 percent year-over-year, it has a real chance of hitting a $1 trillion market cap in 5–7 years, thus becoming the second company to hit that huge milestone. After all, Facebook is becoming the default web for a lot of people, particularly among the millennials (as The Independent pointed out here), is ultimately positioning itself as the social identification layer of the internet, has a thriving ecosystem, and seems to have a pretty clear roadmap for the next 5–10 years based on the last F8 keynote. Truth is that Facebook owns social+pull related activities (discovery, video, events, games) while Google owns business+push related activities (search, calendar, email, drive). What to make out of this analysis is up to you — but it’s going to be lots of fun to watch this play out. Armando Biondi is cofounder and COO of AdEspresso, a Saas Solution for Facebook Ads Optimization. He previously cofounded five other tech and non-tech companies. He’s also an angel investor in Mattermark and 20 more companies. He’s also part of the 500 Startups network, a former radio speaker, and an occasional mentor.